Synthetic Fiber Scrub Mitt will not rot or mildew. Turbo Charges Cleaning Action for FAST Cleaning. Reduces Effort and Fatigue. 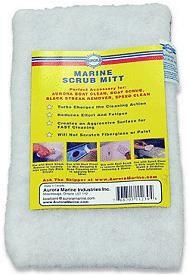 Creates an Aggressive Scouring Surface that Will Not Scratch Fiberglass or Paint.